Over its first four iterations Gameloft's Diablo-esque Dungeon Hunter has transformed from excellent premium mobile game to mildly greedy free-to-play. With this week's release of Dungeon Hunter 5 the series becomes a mildly greedy free-to-play hack-and-slash card-collecting defense game, aka just about everything I dislike about mobile games. I'm not even upset about the free-to-play thing anymore. After the release of the last game in the series I've accepted the fact that the series is no longer the Dungeon Hunter we fell in love with during the early days of the iPhone. Taken as a whole, the Dungeon Hunter series is road map to the rise and dominance of free-to-play games on mobile platforms. The first game was a flat-price Diablo clone with some 25 hours of gameplay. The second upped the ante with online multiplayer. The third game was the franchise's first foray into free-to-play, a weird multiplayer arena title that wasn't quite what fans expected. Dungeon Hunter 4 brought back the dungeon crawling at a drastic cost—players could now purchase skills and equipment with real money. Healing in mid-level cost gems. It was pretty sad. Now we have Dungeon Hunter 5. As a straight up Diablo-style dungeon crawler, Dungeon Hunter 5 isn't all that bad. Characters move fluidly across the screen, attacking and activating equipment-based powers with spectacular results. It's a little to simple for my tastes, but perfect for the audience I imagine Gameloft is trying to cultivate. Purchasing in-game currency still has a dramatic effect on player strength, but that's okay—there's no online multiplayer anymore. Players can take AI versions of their friends into battle—see MrRoge above, running directly through a trap like a champ—but there is no playing with friends. 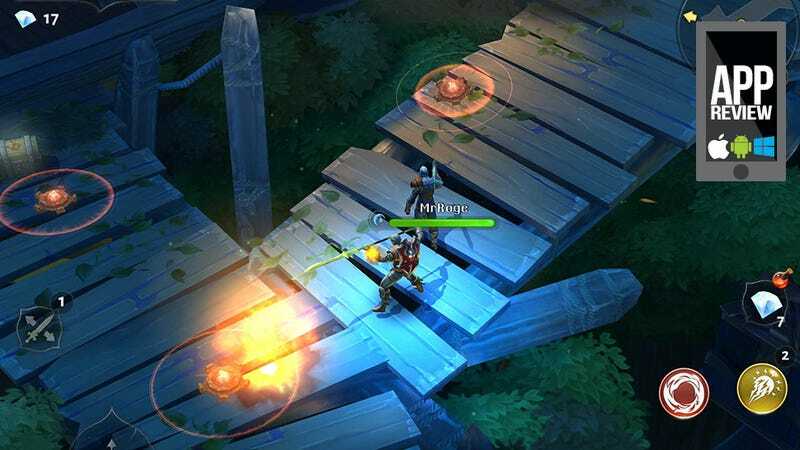 Instead of competitive multiplayer, Dungeon Hunter 5 folds in an asynchronous base defense mini-game, in which players populate their personal dungeon with creatures that opposing players tear through in no-time flat, stealing your gold in the process. You can gather stronger minions the same ways you gather new equipment—via cards dropped in dungeons or acquired via chests purchased via in-game currency. Once you collect these cards you can sacrifice them to enhance your preferred equipment or evolve them into new forms—oh god I'm playing a collectible card game now, and not the good kind. So we've got a base defense game, a collectible card game, and the shadow of an action role-playing game I used to know. Oh, and there's an energy meter. It's like Gameloft Montreal hand-picked everything I hate and made me a sandwich. Then they had a PR person email me telling me the new game addressed many of my concerns with the previous one. Then they laughed and laughed. Thing is, as disappointed as I am and as angry as this amalgam of my most hated free-to-play games wearing the label of something I used to love makes me, Dungeon Hunter 5 isn't all that bad. The action, as I mentioned previously, is pretty tight. There's a real story this time with folks talking and everything. Your character is a bounty hunter, part of a guild that gets wrapped up in something bigger than all of them, because getting wrapped up in smaller things makes for a completely different game (bounty hunter goes shopping sounds like fun though). Dungeon Hunter 5 is everything I hate, but a few things I love, so I think I'm going to keep playing it. I've had human relationships with shakier foundations. I'm going to try and stick this one out. Maybe I'll acquire a rare card and suddenly it will all make sense. Maybe someone will rob my stronghold and we'll become fast friends. We're never getting another premium action RPG the likes of the first two Dungeon Hunter games, but we can still bang about their bling-encrusted bones.